The ceramic sculpture of Samantha Dickie conveys both mystery and metaphor. 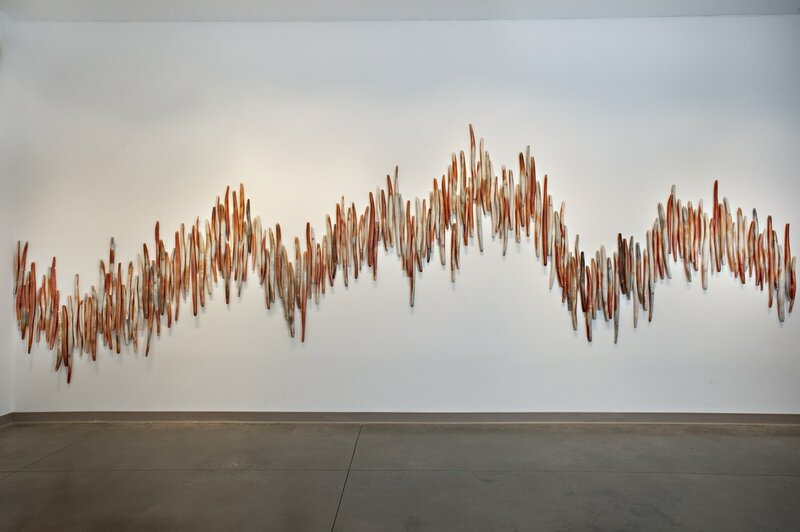 The intriguing textural forms of her multi-component installations invite investigation. What are the structures made from? What do they contain? Why are some surfaces channelled, cracked and charred; others smooth as stone, bone or metal? Are they meant to quietly inhabit space or be stepping stones to other places and sensory experiences. A viewer must take stock, search for meanings, make comparisons, question process and probabilities. All We Can Do is Keep Breathing, 1350 porcelain components individually hung, 8' diameter sphere, 2018. ​At the Canadian Clay and Glass Gallery, Waterloo Ontario. Samantha is honored to be a main presenter at the annual Ontario Clay and Glass Association FUSION CONFERENCE at Sir Wilfred University, Waterloo Ontario, June 22-24, 2018. Info below. The 34th annual show and sale of Fired Up! ceramic artists happened May 25-27, 2018 at Metchosin Community Hall. Jan - April 2018. Dickie's work was juried into an exhibition at the TWO RIVERS PUBLIC GALLERY in Prince George B.C. alongside artists of all disciplines across BC responding to the curated theme of Fences. Artists were invited to consider the power 'fences' have over our behaviour and the different types of physical or metaphoric fences that exist politically, socially and personally. ​​May 4, 2018 Northwest Ceramics Foundation is a charitable organization dedicated to supporting education, appreciation, and excellence in the ceramic arts. Their Oven and Kiln Fundraising Gala and Auction was held on May 4, 2018 in Vancouver drawing donations and patrons from across western Canada.The artist donated part of her Urbanscape series (in banner photo). ​With over 550 components in a carefully designed installation, Viveka invites the viewer to slow down and engage with the show. It is not just about quiet, but also about the pause, about the space between sounds and thoughts. “Hear the presence,” as Sound Ecologist Gordon Hempton writes. This concept is central to the exhibit; silence and stillness are highlighted as essential counterpoints to our modern-day rush of endless stimulus, distraction and constant motion. Dickie began working with clay in 1996 and completed a Diploma in Ceramics from the Kootenay School of the Arts in 2001. 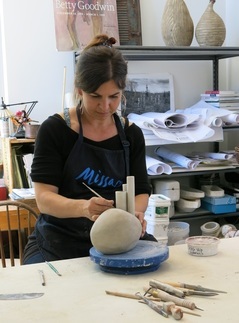 After graduation, her unique talent with abstract sculpture and installations led to several artist residencies, project grants and exhibitions. Each piece is a microcosm standing alone, she explains, but when placed with other sculptural components becomes part of an unfolding and dynamic narrative. During her twenties, the artist spent summers in the Yukon, on 30-60 day canoe and hiking trips. Dickie found the contrast between wide open vistas and intimate details of rugged terrain awe-inspiring. She seeks to express the tension of this juxtaposition in her work, alluding to the “restless space between stillness and movement”. Imprint (below) was created during a residency at the Banff Centre for the Arts in 2003. Many influences percolate through the artist’s enigmatic forms: found objects, the cycles of emergence and decay, remnants of human habitation, the ebb and flow of oceanic life-forms, our personal passages and memories on the road of life. For Imprint Dickie hand carved 50 standing towers of various heights, between 12-32 inches. 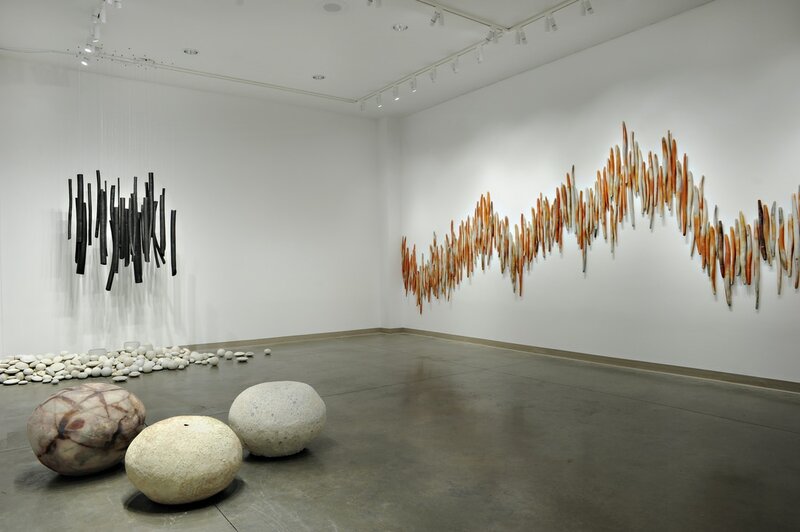 The smoke fired forms resemble charred sticks, driftwood, sea shapes, animal horn and daggers. She spent a lot of time incising patterns into these forms and found the practice to be meditative and soothing. “This was the first time I included personal narrative in my work,” says Dickie, “so was curious to hear the feedback.” Her colleagues and guests at the Banff Centre exhibition made interesting comments. Some said that Imprint reminded them of a field of small totems or remains of a charred forest. Others mentioned hairs on a head, or walking through a miniature forest. Stand was completed during a ten-week residency for the Klondike Institute of Art and Culture in 2004. Dickie decided to enlarge the figures from Imprint for the installation Stand, completed one year later. 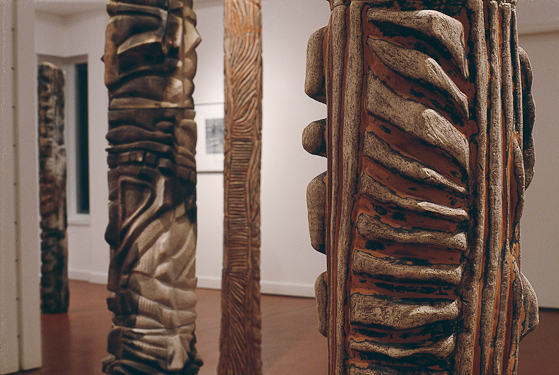 Ten hand built, richly carved totems or towers suggest formations in a mysterious forest. Ranging in size from two to seven feet, Stand presents the macro experience of mark-making in clay conceived in Imprint. Stand received a Research/Creation grant from the Alberta Foundation of the Arts. funded by a Creation Grant from the Canada Council for the Arts. ​In Elusive Containment Dickie showed with painter Janet Moore at the prestigious Yukon Arts Centre Public Art Gallery in Whitehorse. The concept of boundaries, seen and unseen, inner and outer, was the theme. At Right: Exhibited at the Nanaimo Public Art Gallery in 2008. Three Tall Vessels now resides in their permanent collection. While living in Whitehorse (2004-2006) Dickie taught ceramic courses and exhibited in several shows. In June 2013, Dickie attended an artist-in-residence program at the Sculpture Factory in Jingdezhen China. Jingdezhen is a cultural city of 1.5 million called Porcelain Capital for its extensive production. Established in 1956, the Sculpture Factory houses over 400 professional potters on a 24 acres site. Over 100 on site shops showcase ceramics made in the back from a variety of techniques: mould making, press molding, casting, pinching, carving, and glaze painting. Ceramic artists in Jingdezhen focus on one procedure only, and work in a piecemeal factory mode. In Canada, a sculptor completes each step in the creative process. “I found this difference very interesting,” Dickie says, “and engaged in much dialogue about ideas and working methods. An expert mold maker instructed Dickie’s group during her Chinese residency. He made plaster molds of her Urbanscape forms then Dickie used slip casting to produce identical multiples. The photo-transfers on the multiples come from Dickie’s own photographs. Above left: Dickie stands with a grouping of simple forms made at the Sculpture Factory that appear to have a metallic finish. Other shapes in this series have various colours and textures from salt and soda firing. Above right: Widely travelled, her extensive photo collection depicts skylines from major world cities. Diverse images include decaying salt flats in Peru, abandoned mines, carved patterns on a wooden door in Italy and the forest overtaking temple ruins in Angkor Watt, Cambodia. After digital manipulation by the artist, the images moved from a contact sheet into a ceramic photo transfer printing press. Madrona Gallery presents both historic and contemporary fine art by Canadian artists to local and international clients. Michael Warren, owner and Teresa McFarland, collection manager, celebrate five successful years in June 2015. Madrona hosted the Fired Up! preview show in April, and continues to sell Dickie's artworks at the gallery. Michael says: "Samantha has a unique style that defies traditional expectations of the ceramic medium. Viewers can interact with her sculpture on different levels; her finishes are raw not glazed, adding textural and tactile interest. Her contemporary art practice includes ever-changing and energetic installations, as well as selected pieces for collectors." The Jonathon Bancroft-Snell Gallery, located in London Ontario, was established in 2000. 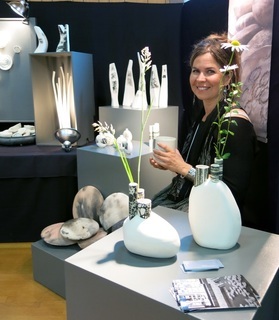 The spacious gallery showcases the work of over 125 Canadian ceramic artists, and draws clients from around the world. Jonathon comments: "Dickie is an artist with exceptional technical skills activated by a keen imagination. Her ability to conceptualize installations with multiple parts and animate these concepts is impressive. Dickie forms are exciting and unusual, yet have an architectural simplicity and modernity that compliment many different settings." The Apartment Gallery was located at 1016 Fort Street. Owner Ellen Manning connected emerging artists with new collectors by offering affordable prices for original art. In 2013, Manning exhibited Dickie’s installation The Living Road in her gallery. Ellen praises the artist by saying: "Samantha is a strong, independent and disciplined artist, who’s received many well-deserved grants and residencies. She has a deep connection to nature and a sophisticated sensitivity to forms. I appreciate her eloquence at translating structures from the natural world into timeless and thoughtful installations." Manning is now a Marketing Specialist at the AGGV. ​“Above and Beyond” award, hosted by Black Press. Cathie Ferguson, Paul Leathers, Paul Gaudie.